From there on for me it’s doing sketches, scribbles and have a look what would work in my opinion. 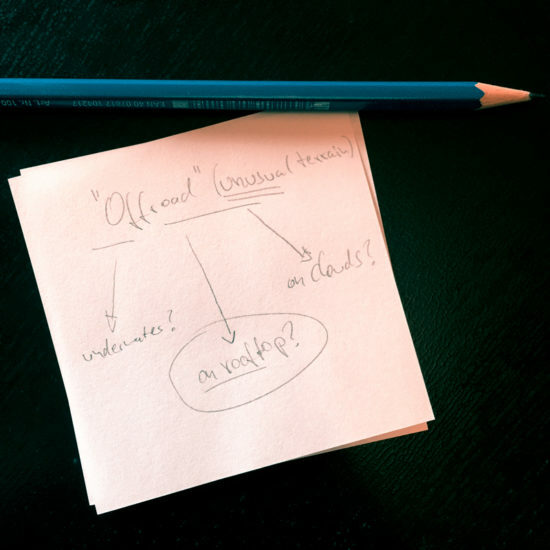 Brainstorm, sketch it out, start over again. Until I am satisfied with it and can start thinking about locations to work in and the things I need to keep track of (lighting of background and subject). My first idea was a helicopter delivering the car – but then I after I sketched it out, I thought to myself it makes it look even better and makes more sense if the “offroad”-car already got there itself (because when it’s “truly offroad” it can get there by itself, right?;-)). 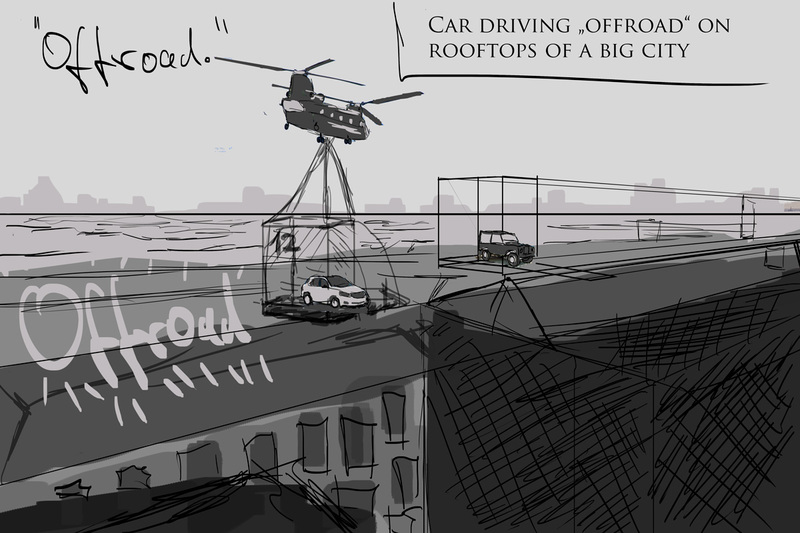 So I thought about some sort of parking lot/space on top there and sketched it out. The Rooftop-scenery was found pretty quick, as Berlin has a lot of cityscapes that don’t look too futuristic and have a nice texture – we went for a nice little neighbourhood somewhere in the east, without big skyscrapers and everything. Afterwards we had the picture with the car in front of a sort-a neutral background and from a decent angle – and a sky that could make it look like it’s been cloudy and rainy all day. I tend to shoot my backgrounds always first – although I’m sure it’s possible to do it the other way ’round (for example Matthias Schwaighofer – or for someone who’s planning and preproducing an immense time before he shoots, watch Benjamin von Wong‘s works – e.g. his Mermaid shoot just blew me away!) For me it’s just easier to already have a background and then imagine the subject in it before I shoot again – just my preferred way of working. From then on it’s postproduction all the way. 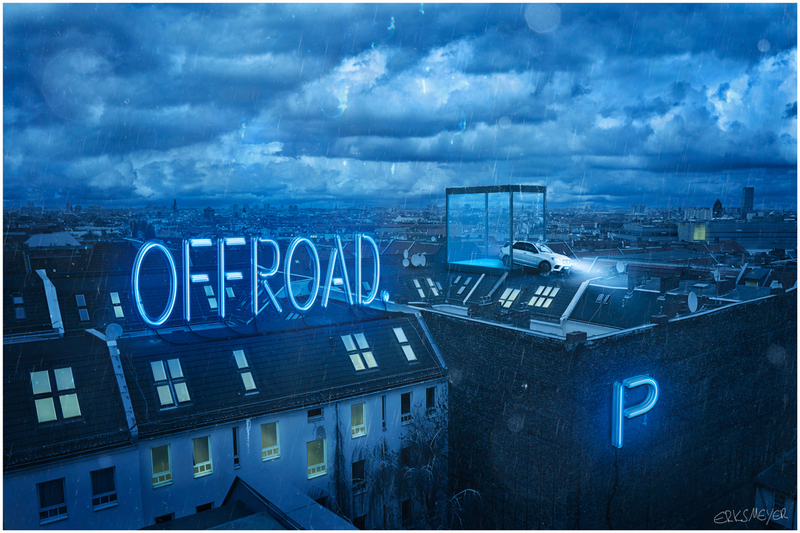 I wanted some sort of “parking lot on the rooftop” for the car to come out of… I tried several set-ups, with a wooden-box, some sort of concrete walls. But since the car should be thing to watch out for – although it’s not the biggest part in the image – I went for glass. 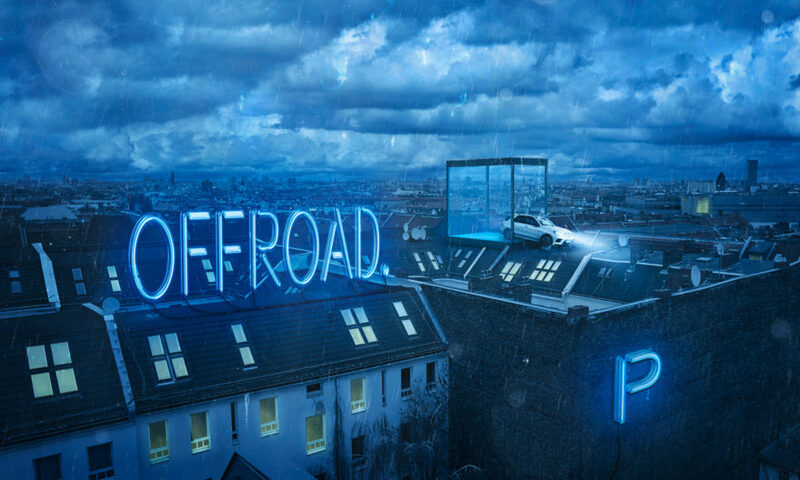 To exaggerate the concept a bit I put up the big neon-Offroad sign on the rooftop in front and turned the whole scene into night and created a rainy atmosphere to enhance the mood of being offroad even further. The water droplets and lens flares have all been photographed separately in studio and took quite some time as well – but as I always want a perfect image in the end, this was necessary and it was worth it (see down below in the making of). So here’s a layer breakdown of my piece “Offroad” – in the final version it’s been 353 active layers in Photoshop; quite some, huh? By the way – Josh Rossi also did an amazing job working for about 300 hours (!) on ONE single image, it’s amazing, have a look! Which are yours? I’m eager to read some new names, because I’m pretty sure even I don’t know everyone out there, and I just LOVE to explore great portfolios!